Beth Dooley: Garden in a Jar! Suddenly, the temps have turned; a few are trees tipped red and gold. The afternoon light is softer and the evening sky turns indigo earlier day by fleeting summer day. My heart thumps. Change, loss, grief? The ancient tug of fall. Hurry, get the garden in, gather all that's ripe and ready. My youngest son just left for college, so soon. Must everything end so soon? Hurry, I think, don't linger, get to the garden, gather and cook. 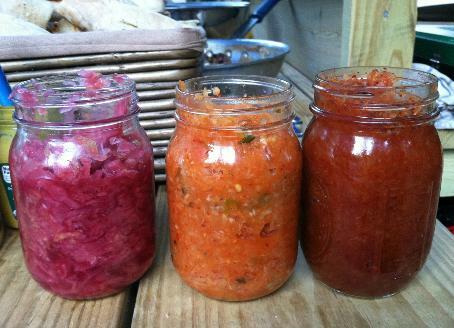 It's a good time to make pickles and condiments to relish later in the year. These recipes are relatively quick and easy and because they're stored in the refrigerator, they do not need to be "canned" with a water bath. Because the quantities are small, the work is less messy and they will taste very fresh for several months after being made. Engaging in this simple work makes it easier to kiss summer good bye. You can eat this a day or two after making it and it will keep at least a month in the refrigerator. Fabulous with grilled brats, it's a must with roast or grilled pork. Put all of the ingredients into a large saucepan adding just enough water to cover them all. Set over high heat and bring to a boil. Reduce the heat and cook just until the cabbage is wilted. Spoon into a large canning jar and cover. Allow at least a day or two for the flavors to marry. This slightly sweet and spicy relish is great on the cheese tray or served on grilled or roasted chicken. Put the vinegar, water, ginger, honey and salt into a large saucepan and bring to a boil. Turn off the heat and add the carrots. Stir and allow to stand until the carrots are limp. Spoon into jars and cover. Store in the refrigerator at least 2 days before enjoying. In a preheated 325 oven, cook the beets until tender, about 30 to 45 minutes. Remove and allow to cool. Peel, and chop fine. In a large stainless steel or enamel saucepan, bring the vinegar, sugar, salt and horseradish to a boil. Add the beets, onions and peppers and turn off the heat. Allow to cool and turn into the canning jar or jars. Cover. Refrigerate and allow two or three days before enjoying.